Taking time to reduce injuries from slips, trips or falls is an important investment. Simple steps such as keeping the yard clean, maintaining good lighting, or donning appropriate footwear can sometimes be all it takes to prevent a serious injury. 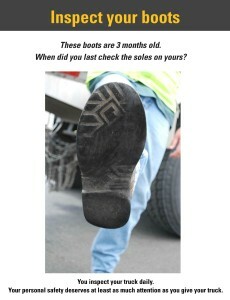 Checking your own boots and encouraging your staff to do the same is a simple measure you can take to improve your personal safety. The highest safety standard is our minimum commitment, and we are fully OHS compliant. Contact us today to talk about how our experience helps us to ensure that we can get your job delivered in time, without sacrificing safety.